Power Go Out Unexpectedly In Your Area? Flower Pot Heater- Here's a very simple, dirt cheap homemade heater made out of Flower pots and tealights that you can put together in under 5 minutes flat- and here's the kicker, It Actually WORKS. First, place the tea lights in the loaf pan and light them. Place a brick on either side of the loaf pan and set the cooling rack on top. Place the Smaller Clay pot upside down on the cooling rack, directly over the lit candles in the loaf pan. Place a Nickel over the hole on the bottom of the plant pot to completely cover it. Failure to do so will result in very little heat. Alternatively, you could use a piece of aluminum foil to cover the hole. 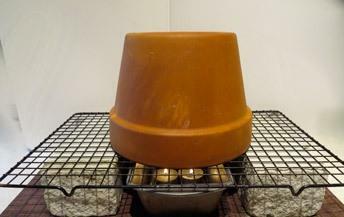 Place the Large plant pot Over the small plant pot, creating a Heat Hut. After 35 minutes it should reach its full heat. At this point you should NOT attempt to touch the plant pots with your bare hands as you will get badly burned. Depending on the brand of your candles, they should continue to burn about 3 hours. To replace the candles simply slide out the loaf pan, replace the spent tealight with a new Lit tealight and return it to the spot beneath the pots. to keep an 10x12 room fairly comfortable if you light it as soon as the power goes out and avoid opening and closing doors, etc.